internal and external fitting types available. Made from high quality long life waterproof vinyl, each sign is either 50mm or 80mm in diameter (both sizes available) and coloured blue with a white figure as required by the new law. Simply stick the sign on the window next to each double/single seat, peel off the low tack application paper and you're compliant! 55mm x 150mm, internal and external fitting types available. 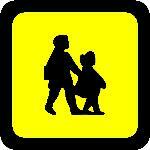 An ideal upgrade to the standard pictogram, giving the clear message "Seatbelts Must Be Worn". Simply stick the sign on the window next to each double/single seat, and all your passengers will know beyond doubt that they have to wear their seatbelt! 10" x 8", internal fitting. Ideal for fitting at the front of the vehicle. 65mm diameter red No Smoking sign with no background for discreet application to windows etc., 12 signs per sheet, internal fitting. Self adhesive ideal for sticking to bodywork or on outside of windows. We can supply legal lettering of any size to suit your requirements, any colour, most font styles available. Please email or phone with your requirements. £2.50 for the first item ordered, with subsequent items at £0.50 each when all purchased together.